I didn’t see the point of a tablet until I got one, and now I can’t believe I ever lived without one. Samsung has a tablet in its stable of Galaxy products, but are these the 10.1 inches that you’ve been looking for? As seems to be the way with all non-Apple tablets, this one is designed to be held in landscape, making it ideal for navigation while watching videos as well as playing most games which tend to use landscape rather than portrait orientation. Of course tablets can be held however you like, but depending on button locations, this can seem more natural in certain ways. 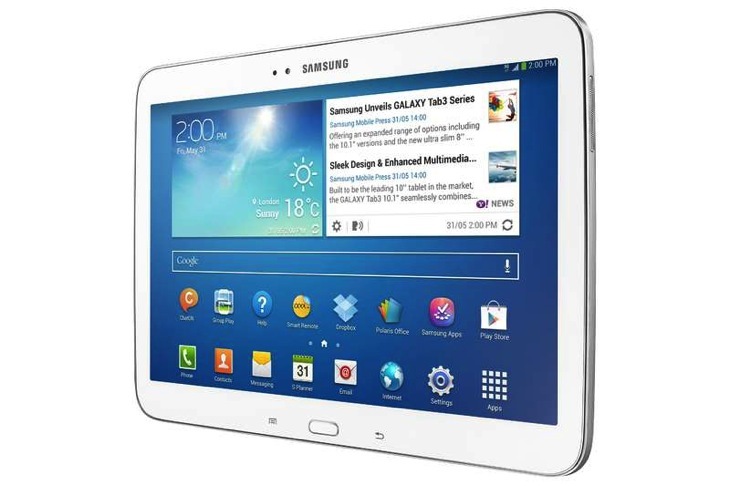 The Galaxy Tab 3 has three buttons for navigation, the main big button that returns users to the home screen or can be double tapped to issue voice commands, as well as a back and menu button. This can help a ton when navigating within apps, although of course most users will rely on the awesome and sensitive touch interface. As long as we’re on the tactile component, the weight of the Galaxy Tab 3 made me more inclined to use it as a surface rather than as a general tablet – it was at its best when resting on my desk for all my swiping pleasure, rather than held in the hand. It weighs in at 512g, which it’s exactly heavy, but was too heavy for me to hold at certain angles for extended periods of time, like when I wanted to read on it. That said, the borders are nice and rounded without any sharp or rough edges, so you do choose to hold it there shouldn’t be any discomfort. Be prepared to hold it for a long while – this little baby doesn’t need to be plugged in for about eight hours of use, although obviously battery life varies depending on Wi-Fi and app usage. The tablet itself is white, which seems to be all the rage in tech, but I still find a bit weird. It ends up making the tablet appear less slick for me; I would have loved to see it in black or chrome. The 10.1″ tablet has a screen resolution of 1280 x 800. This is fine for most tablet users – games and videos look crisp and clear on it. However, if you’re used to HD you might not be satisfied with it. Additionally, the tablet makes use of eye tracking to ensure that it stays on when you’re looking at it and then turns off when you look away. Unfortunately, it never seemed to be able to detect my eyes. You’d expect this might happen with Geoff, but the thing really should be able to pick up my big hazels. I unfortunately can’t tell you how well this system works. The Galaxy Tab 3 has cameras in the rear and front. This means that you can snap that excellent moment of the cat on your lap, or Skype your loved ones. While the main (rear) camera can take passable photos for Facebook or other social sharing moments, I wouldn’t recommend it for anything more important than that – the pictures just aren’t that crisp and clear and I found it difficult to focus on the things I wanted. The front camera will be functional for video calls, but prepare to look rather grainy and pixelated – that 1.3 Megapixel camera won’t do anything nice for your complexion. Do I make you (h)Appy? Before looking at the specific apps the tablet comes with, it’s important to point out that Samsung uses their proprietary version of Android. Android is essentially a Google Operating System (OS) that companies can use as a foundation for their own OS. 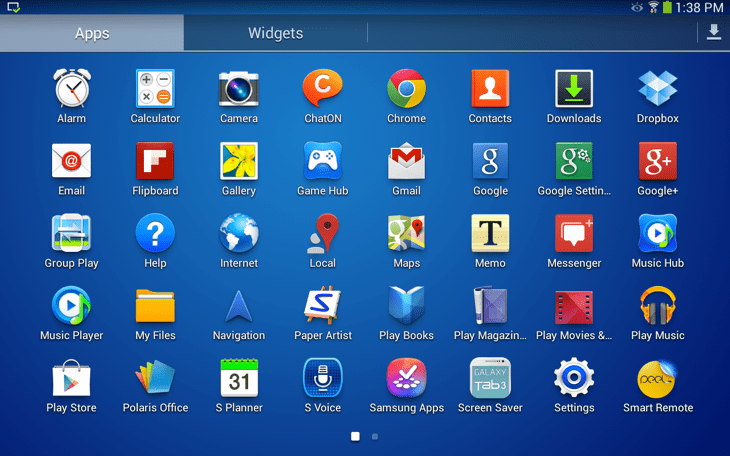 Samsung’s version (TouchWiz) is incredibly easy to use and intuitive, making their phones and tablets quick and easy to pick up for anyone to play on, even if they have never used a tablet before. The Samsung Galaxy Tab 3 is ridiculously easy to use thanks to Google linking everything together – with the quick startup you can make sure your Chrome, Youtube and Gmail are all synced to the tab without any hassle. It comes preloaded with plenty of apps for you to play with, and of course you get access to the entire Google Play Store. However, upon start up you already get Youtube, Smart Remote (yes, you can use the tablet to control your TV), Flipboard and Google Talk, along with a whole host of other file management software including Dropbox. You do also get access to Samsung Apps although I didn’t see anything on there that wasn’t also available through the Google Play Store. While applications and games work perfectly well on the Galaxy Tab 3, I couldn’t help but feel like it was a bit laggy. This was particularly noticeable when switching between applications. Even once things were loaded from the internet, or already open and running, it just seemed to take a few too many seconds to switch from one app to another. This could be do to application bloat – due to coming pre-loaded with so many applications, the tablet drags when performing tasks. Here’s hoping that the new Samsung Galaxy Tab Pro doesn’t have this same issue. All in all the Samsung Galaxy Tab 3 is not quite right in its 10.1″ form. It’s too heavy to really be ideal around the house without the processing strength to justify that weight. However, if you want an easy to use tablet that will easily interface with all your other preferences thanks to Google, Samsung’s Android OS is fantastic. With this price tag, I’m just not sure it will be worthwhile to all consumers; if, however, you can pick it up for cheap while waiting for the Tab Pro, it might be an excellent entry into the Android tablet experience.